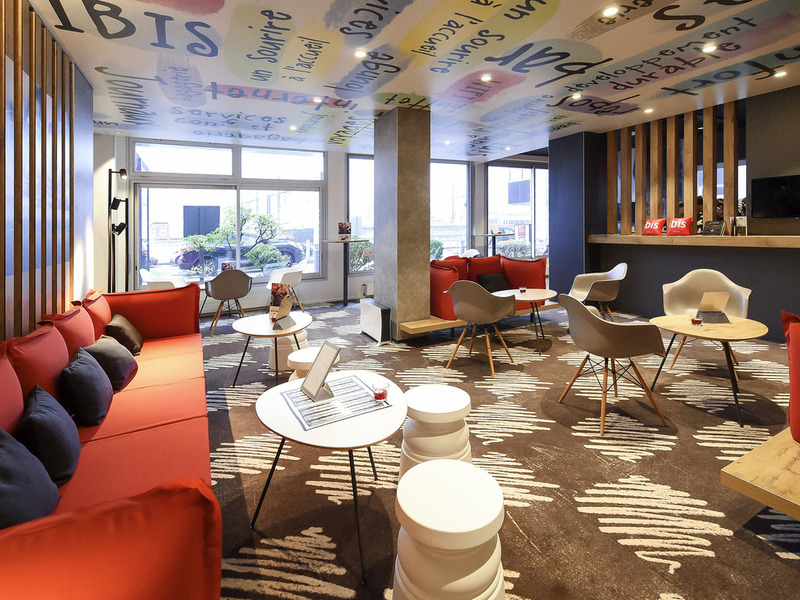 The ibis Dijon Gare hotel is located 219 yards (200 m) from the train station, close to Dijon's historic city center and just 2.5 miles (4 km) from the convention center. The hotel has 128 renovated, air-conditioned rooms, a restaurant, a 24-hour bar with terrace and 5 modular meeting rooms (for up to 200 people) for seminars and conferences. Business guests receive WIFI Internet access. Free enclosed outdoor car park available. Located just a stone's throw from the center of Dijon, the SNCF train station and tram lines, the ibis Dijon Gare hotel is ideal for your business trips and vacations in Burgundy. Situated next to the Arquebuse botanical gardens, 10 mins' walk from the center of Dijon. Friendly, very helpful staff, clean, recently refurbished hotel, conveniently located to station and town centre. Breakfast was good but the layout of the buffet was a bit crampt and disorganised (eg. cereal at one end and milk at the other) with guests bumping into each other. The first day i arrived after the usual check in and welcoming, i made my way to my room. After the long hours of travelling i tried to get some rest and sleep but to my dismay, There was a very loud and disturbing construction or renovation at what sounded like to the room next door to me. It was very uncomfortable and frankly speaking inconsiderate. The breakfast was a total disgrace and it was clear that some of the content available have been there for weeks as some of the pastries were stale and moldy. the coffee machine did not work and there wasn't any hot food option available. I am a regular member of accors and as a silver member, my patronage is quite obvious but i must say, I was really disappointed with this hotel. The only positive note that i can add was that the members of staff were very friendly and always happy to help which made the whole experience bearable. Comfortable hotel, friendly helpful service, room too warm. Clean, comfortable room. The concierge was very helpful advising us about restaurants. The bedroom was too warm and opening the window made it too noisy as we were close to the station. A very comfortable night's stay with good food. Friendly and helpful reception staff. Easy parking on site. Good location. Clean and comfortable room. Convenient hotel with easy station access and pleasant ten minute walk to the centre of town. Standard IBIS hotel - but ticks all the boxes. Staff pleasant - rooms adequate size. Typical Inis stay with most expectations met. Fast, friendly check-in, room clean and generally comfortable. Other Ibis properties have had cooler in lobby with complimentary water and kettle, cups, tea bags and instant coffee. Staff very friendly and accommodating. We appreciated having some perishable items stored in the front office refridgerator. Central location near the station, however car park out of use which was unexpected. Parking offered in the station car park but meant had to unload everything from car and then walk back to the Hotel. Only 50% of car park fee refunded by Hotel.. Understand this parking issue is temporary and the excellent car park attached to the Hotel should be available in October. Hotel was clean and comfortable as was room, with excellent shower and large double bed. Note Drinks in bar much more expensive than in restaurant- 2X 33cl bottles of Perrier only 80cents less than litre bottle. . Dinner in the restaurant was good, and chef made excellent salad for vegetarian beyond what was shown in menu. Service at meal was poor. Long time waiting to get menu, drinks and between courses. This could be because the Hotel had a large booked coach travel group and they seemed to have priority over other diners. Coffee was taken in the bar , however once prepared the coffee was left on side of bar out of reach whilst staff attended once again to the coach party. A complaint to staff meant payment was waived for the lukewarm coffee. Breakfast was v good with good range of options. I booked 2 rooms and air conditioning in both rooms did not work when we arrived. However, the lady from reception was able to sort out the problem by the time we came back at night. My husband and I came from London and there were severe delays on the Eurotunnel, which made our journey to be delayed by 7 hours. We contacted the hotel to let them know we'd be arriving in the middle of the night and were worried we'd lose the room, but Valentin Boivin from the front desk quickly responded our email telling us to not to worry, which we couldn't thank him enough for that. Room was clean and pretty, the bathroom was quite big and newly decorated. Parking is free of charge. The only minus was the air con not being powerful enough. Having attended the Université de Dijon 40 years ago, I was so happy to return. The hotel was the perfect location for exploring the city and the tram was an easy trip to the university. The staff was very kind. The room was comfortable and thankfully cool as the weather was quite warm. The breakfast was very good. There should be a timer for the eggs. Our stay in Dijon was perfect! It was only a brief one night stay as we were traveling from Paris to Switzerland and needed a place to rest in between. The gentleman at the reception who greeted us on July 7th upon check in was very professional and attended to our care. Location was also great as it was near the tram station that will take you straight to the city center of Dijon! Room clean . Excellent breakfast. Very helpful staff. Air conditioning useless - room too hot to sleep comfortably. Booking difficult - tried to book as a member in reply to email but did not succeed. Very frustrating. Have sent emails to customer services regarding frustrations but no reply - not professional . Will probably go back to Hotels.com.